"This is another 'lucky' situation when things turn for better. While making my raspberry jam, I totally forgot to add pectin. The result: exactly the same that if I did add some. Easier, simpler, and less risky than adding pectin to it." Bring raspberries to a boil in a very large pot. Cook for 4 minutes. Add sugar and lemon juice; stir well. Bring back to a boil, stirring constantly. Cook for another 4 minutes. 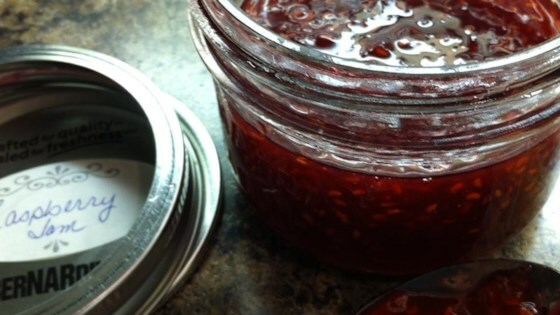 Remove pot from heat and pour jam into sterilized jars, leaving 1/4-inch of space at the top. Seal and transfer jars into a boiling water bath. Make sure jars are covered with at least 1 inch of water; let sit for 5 minutes. Lift jars and let them cool in a draft-free place without touching, 8 hours to overnight. I/2 pint of raspberries, 1/2 cup sugar, 2 teaspoons lemon juice, cook for 12 min stirring often. Ready when can run spoon through and see bottom of pan for 1 second. Yield 3/4 of small jam jar. what terrific raspberry flavor - way better than the standard jams. I cut the sugar a little ( I like tart) and it still worked out great.